Brian Kakuk and Jill Heinerth, two of cave diving's most acclaimed explorers, have teamed up to share their expertise on side mount diving in the generously illustrated and practical manual, Side Mount Profiles. The cover photo features Australian cave divers Linda Claridge and John Vanderleest. 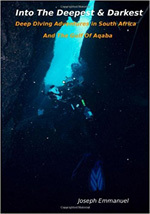 This book is now available for purchase from the Cave Diving Down Under online shop. Jill's two other recent books, The Essentials of Cave Diving, and Digital Underwater Photography, are also available. Free postage in Australia on all items.